Looking for the best family tent for summer adventures? We were too until we stumbled across the NTK Arizona GT 9/10 tent that fit the bill in every way. It’s a decently packable large family tent that gives your family a lot of flexibility in the great outdoors. Our family is big into National Park adventures. Our plan is to visit every National Park before our kids turn 18, which feels like a really big task at the moment. We like to enjoy the National Parks by camping in them because it just isn’t the same when you visit for a day and go to a hotel room. Before kids, we used to do a lot of backpacking, and have a 3/4 person MSR tent that we absolutely love. We’ve had it for about 15 years now and it is just starting to lose its waterproofing. With two young kids and week-long trips, we wanted a large family tent that would give us a little space. We fell upon the NTK Arizona GT 9/10 Tent – rated the 6th best family tent in the US (but I think it should be #1). This baby is huge. It sleeps 9-10 people, which is a big change from our super…comfy…quarters in the MSR. The breathing space allows us plenty of room to stand up and change after the beach, a necessity with young kids. Read on to find what we loved, and hated, about the NTK Arizona GT family tent in this review. The NTK Arizona GT family tent can sleep 10 people. Honestly, we use it to sleep 4. Our kids don’t like to go to sleep together, something about being in a tent and within talking distance either starts up a whole lot of bickering or a whole lot of storytelling. 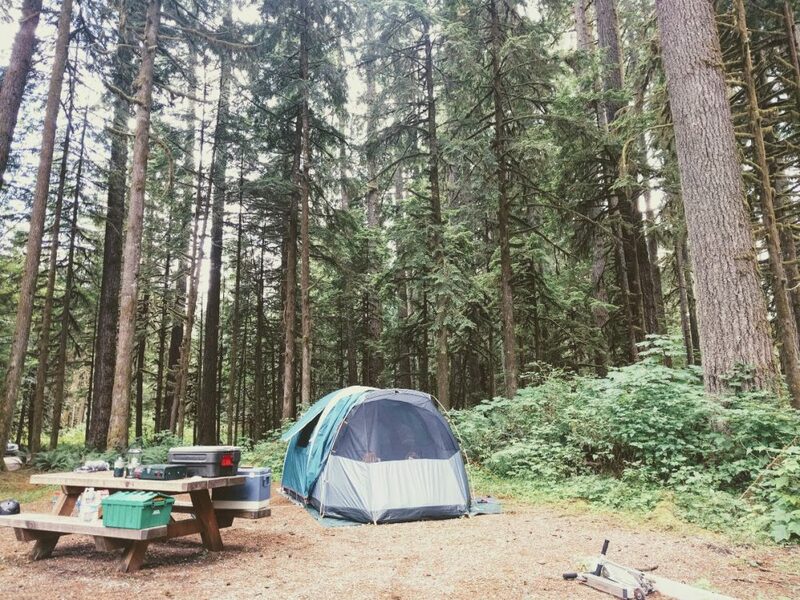 We have always found our camping trips are a whole lot happier if we can split them up. The NTK Arizona GT tent has a room divider, that allows them to at least have a thin wall between them, which drastically reduces their trouble in falling asleep. You can stand in it. I consider this huge. With little kids, it is such a pain to try and get everyone dressed for the day if you can’t actually stand up. Since this is a large family tent even my six-foot tall husband can walk around in it. Seriously. It seems like such a minor point when you are looking for the best tents, but when you are out in the wilderness with little kids, this can make or break the experience (and your back). And it’s not just one tiny postage stamp piece of the floor he can stand in. The non-dome shape of this tent allows him to walk around in it. You can sleep under the stars. This might be my favorite feature of this large tent. The front room can serve as a screened porch. Often once our girls are happily passed out we will slide their sleeping mats into the same large room, and roll out our mats int he screened room. If the weather is nice (ie it’s not raining), you can roll back the rain flap to expose the entire tent area from the waist up. This massive screened in area allows unparalleled views of the night stars as we are dozing off to sleep. It is also a great place to read before we hit the sack since the screen protects you from all those annoying mosquitoes. It is waterproof on the bottom. The NTK Arizona GT tent is waterproof. To be honest, I think they may have gone a little overboard with the waterproofing of this tent, but man do I appreciate that. The floor of this large tent is called a bathtub bottom. Basically, the floor wraps 5 inches up the sides everywhere. 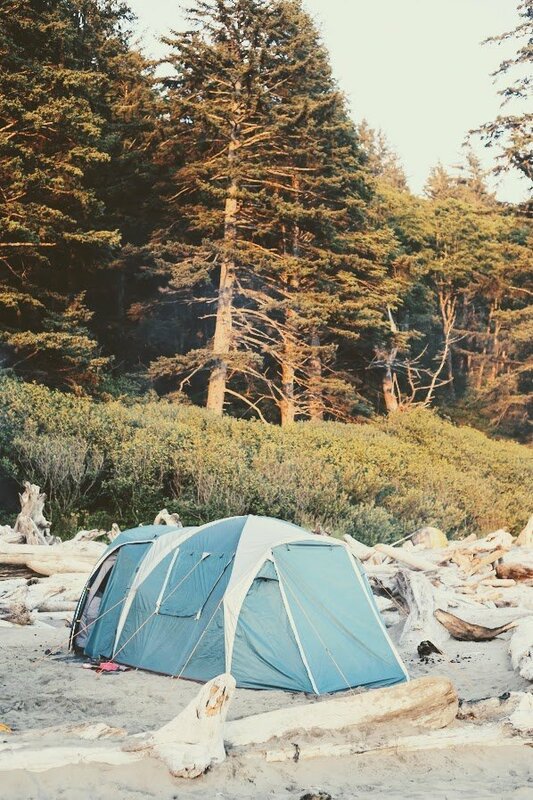 This has come in really handy when we were camping on Second beach, a gorgeous beach inside Olympic National Park. There was a exceptionally high tide that night. 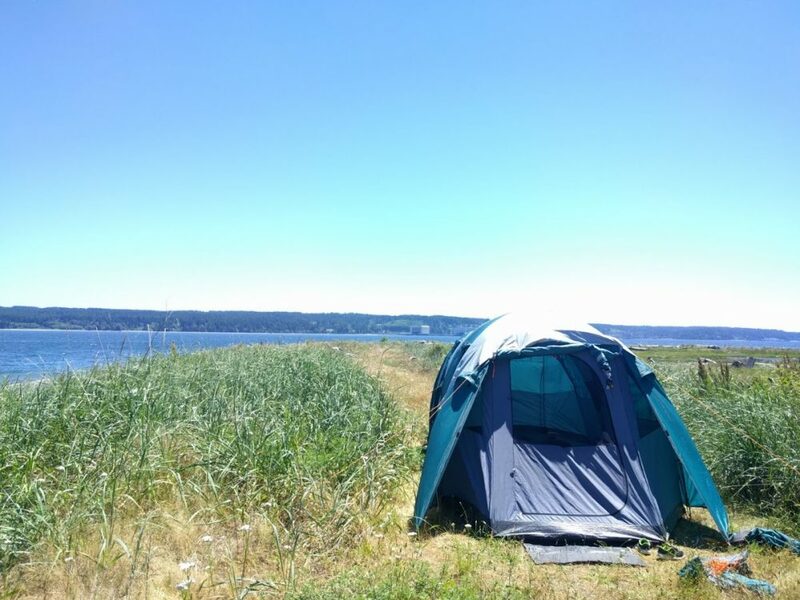 My husband and I were woken up by the sound of the ocean literally lapping at our tent. And guess what? We were dry. Sure we had to make some midnight emergency sand piles to make sure we were safe from an even higher tide, but the ocean was lapping at our tent and we were dry. Honestly, if that isn’t an amazing reason to search for a bathtub bottom in your next large family tent I don’t know what is. It is waterproof on the top. OK, this is a no-brainer to look for as you are shopping for large family tents. Nothing ruins a camping trip quite like having all your gear, and your kids, soaked. Talk about misery. The rain fly on this family tent is no joke. When they say button down the hatches this family tent can really take the cake. Plus, because it is such a large family tent, you can actually enjoy being stuck in a downpour that feels like a waterfall happily playing card games. In our multiple years of camping with this family tent, we have never once gotten wet inside of it if the rain fly was on. It’s packable (considering it is a large tent). I won’t lie. We car camp. So far we have driven to all of the National Parks we visited, so packing in gear has never been an issue. With that said, this tent does pack pretty well if you want to go into the backcountry or no man’s land. It comes in at 13 pounds, which is really heavy for a backpacking tent, but not bad for a large tent. We packed this baby in over a mile to get down to the beach with no issues. It fit well in a regular pack and we just had one adult carry the tent/cooking items/playthings and another adult carrying the adult sleeping bags, clothes, and water. We let our kids pack in their own gear, even our then 3-year-old packed in her clothes – although we happily tied her bag onto the outside of one of our packs. Our then seven-year-old? She packed everything she needed for the trip. The ability to hike this tent in on small trips (I would say max 3 miles in) is a great benefit to connecting to nature. Setting up this tent is really a piece of cake when you consider how much trouble some large family tents can be. The poles are color coded and there are only three of them you need to get the large tent aloft. 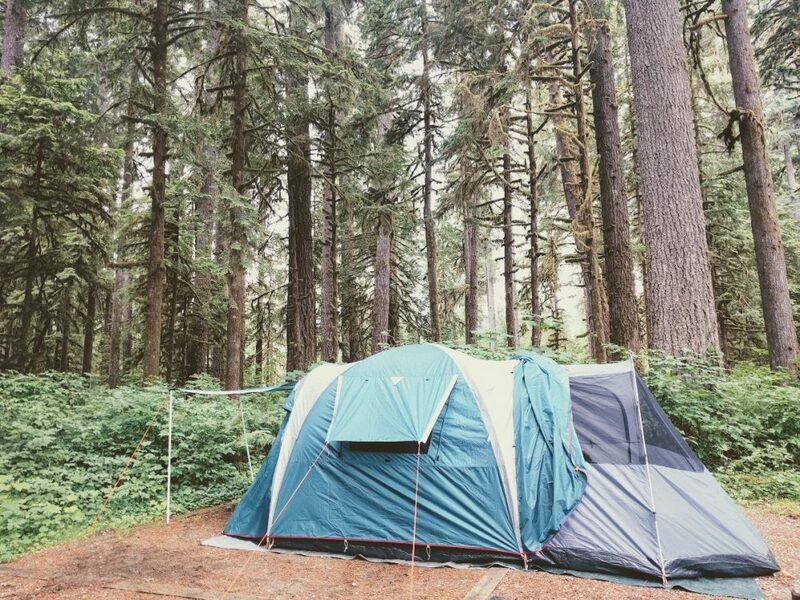 Just put your poles together, slip through the tent seams, tie down the tent with stakes and voila! You’re ready to move in. It is equally easy to dismantle. One person can get the tent setup or taken down in under 15 minutes. Stands up in the winds. We took this tent to a beach one time that had sustained 30mph winds. The tent managed them beautifully. There was no flaps flying around, no tumbleweed action, and no wind inside the tent. For a large family tent, she held up beautifully to the rugged conditions. You can’t open windows from inside. I find this mildly annoying. I am guessing because this tent is so bug proof and they didn’t want any tiny little holes between the top of a zipper or something to be free access to mosquitoes. And while I appreciate knowing our tent is bug-free, I find it annoying that if we want to open a window in the middle of the night someone has to get out of the tent to do it. I’ve probably only encountered this annoyance a handful of times in our years camping, but still. Seems like a zippered outlet would e a great addition. Single person rain fly setup can be tough. Since this is a large family tent, the rain fly is, well, large. That can prove to be a pain if there is only one person available to put the rainfly on. Not that it can’t be done – my husband does it often as I wrangle the girls. But if you were just over 5-feet tall like me? It could be a pretty big challenge. OK, I realize this is a bit ridiculous to complain about. In the pro list, I mentioned how this baby sustained 30mpg winds over time. And the reason why she could is that there are a zillion and a half tie downs. The NTK Arizona GT tent likes to have all of them in place to perform. Really, she needs all of them in place to perform. That means it takes a while to prep for windy weather, but like I said, this is really a ridiculous complaint because I want our tent secure in the wind. 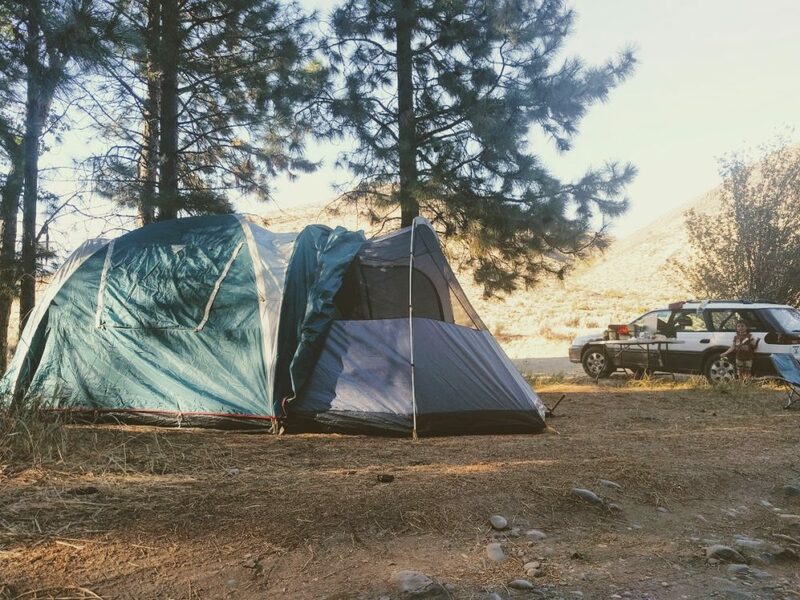 There you have it, our NTK Arizona GT family tent review. I hope it helps you make the right choice. You can get these babies on Amazon for a great price too. Less than $300 for a large family tent that does all of these things and is quality made? Seriously, priceless.